Fido and Fluffy have met their match with the Fetch pet vacuum, which combines the unmatched cleaning power of the Synchrony with the accessories you gotta have to clean up after your furry friends. You’ll be sitting pretty with Fetch’s new self-sealing HEPA media bag system that makes it easy and clean to replace the bag. With HEPA media and granulated charcoal filters, Fetch traps the dirt, dander and odors your pet leaves behind on carpet, rugs and upholstery. Fetch comes with the new Pet Hair Beware self-cleaning upholstery tool that’s relentless on pet hair and a one-pound canister of dry carpet cleaner. 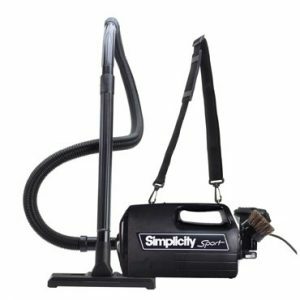 Like all other Synchrony vacuums, Fetch is durable with lots of metal where it matters and the patented Tandem Air cleaning system. Plus it’s backed by a 7-year warranty and the Very Important Vacuums service plan.